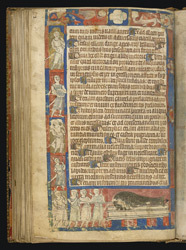 A page from the section of instruction on war has a border populated by noblemen with weapons. The lower border features a primitive canon being operated by a group of soldiers. The decoration remains unfinished, raising doubt that Milemete ever presented the book to the king. It has been laid out, decoration sketched, text written, gilding applied, and ink applied over the sketch. Work stopped during the last stage, application of colour.